I love chicken wings! These wings have a beautiful balance of heat and sweetness, which will have you coming back for more! 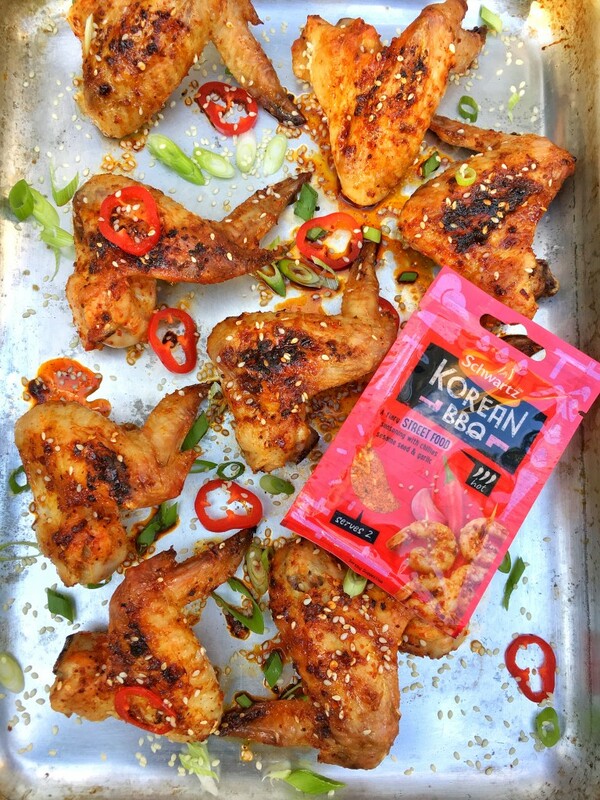 Coat the chicken wings in the sesame oil and 2/3 of the Schwartz Korean BBQ spice mix and leave to marinade for up to 24 hours. Preheat your oven to 180F/200C. Place the chicken wings on a large baking tray and cook for 30 minutes or until nicely golden and cooked through. Whilst the chicken is cooking, make your glaze. Combine all ingredients in a small bowl and mix together. Remove from the oven and brush or spoon over the glaze and whack under the grill until super crisp. Remove and allow to rest for 5 minutes before topping with finely sliced spring onions, sesame seeds and some slithers of fresh chilli. 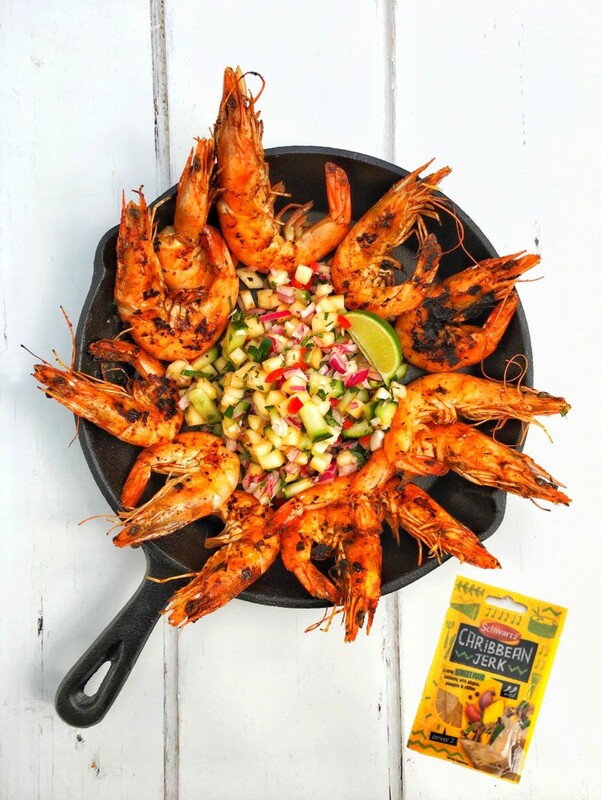 Coat the prawns in the olive oil and the sachet of Schwartz Jamaican Jerk spice mix – leave to marinade for at least two hours or overnight if you’re very prepared. Cut the pineapple and cucumber into small cubes and finely dice the red onion. Finely chop the fresh mint leaves and combine all ingredients together. Squeeze over the lime juice and coat the salsa. Put a large frying pan over a medium heat. Cook the prawns for two minutes per side (until the prawns look nicely charred) in small batches so there’s plenty of space in the pan. Remove from the heat and cover with a squeeze of fresh lime juice. Serve the prawns alongside the pineapple salsa and get stuck in!